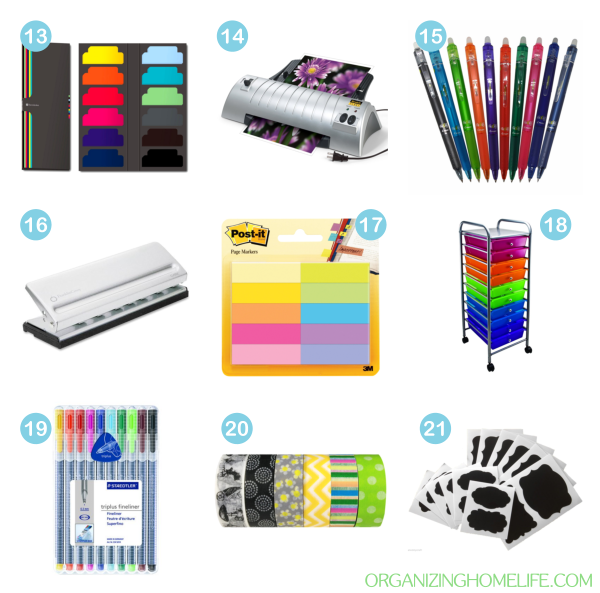 If you are reading this post either you love organization or you know someone who does. 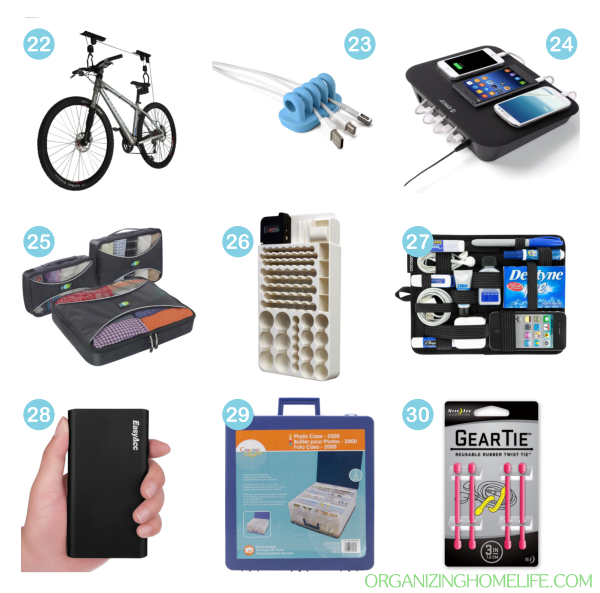 You’ve heard organizers suggest ideas for clutter free gift ideas (which I love!) and NOT to buy organizing bins and baskets unless you know specifically what you’re going to store in them. 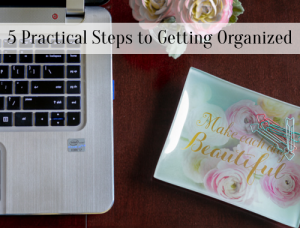 So what DO you buy for someone who loves to organize? 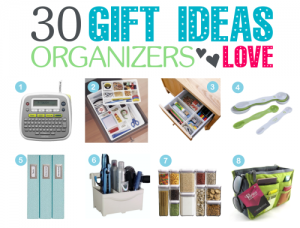 Here are 30 gift ideas for organization lovers. I own and use many of these products and would love to share some of my favorites with you! Product links are affiliate links. Many of these can be found a local stores as well. 1. Brother P-Touch Label Writer – my favorite label writer – no peeling labels! 3. 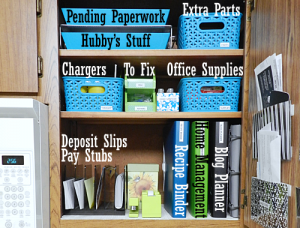 Customizable Drawer Dividers – comes with 20 strips for ultimate versatility! 4. Magnetic Measuring Spoons – easily and neatly store measuring spoons without creating a mess in your drawer. 5. 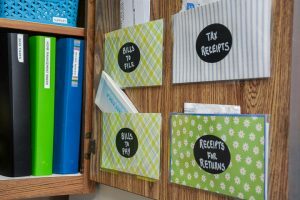 Martha Stewart Adhesive Book Plates – label binders, bins, and baskets with these stylish bookplates. 6. Hair Products and Styling Tools Organizer – I use this and LOVE it! It’s perfect for keeping the bathroom vanity organized. 8. Purse Organizer – one of my all time favorite ways to keep a neat purse and make changing purses simple! 10. 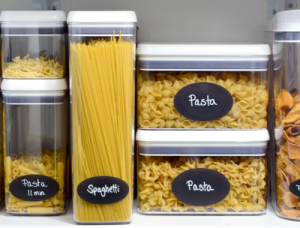 InterDesign Fridge and Pantry Clear Bins – my fridge and pantry have never been more organized since I started using these. 11. 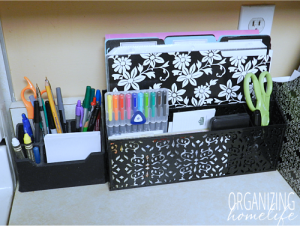 InterDesign Multi-Level Organizer – perfect in tall bathroom drawers. Spaces for toothbrushes, toothpaste, floss, clippers, and more. 12. Expandable and Customizable Under Sink Organizer – one of the best products I have used to organize under my bathroom sink. 13. Sticky Tab Markers – not super sturdy, but perfect for marking pages. Made from heavy weight non-glossy paper for easy writing. 14. Laminator – I can hardly imagine not having this product. 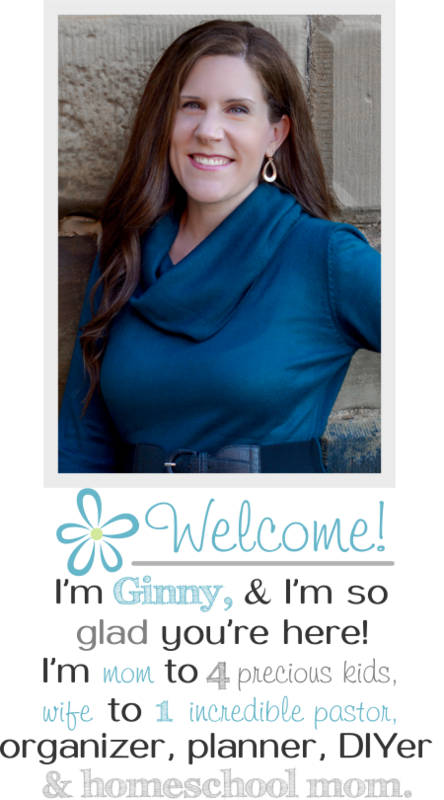 Make labels, lists, chore charts, and all kinds of printables more durable. I have used this laminator for years. 15. Frixion Erasable Pens – I cannot even begin to tell you how much I love these pens. They are a little pricey, but my go to pens for almost everything. They have heat sensitive ink and erase easily without leaving “eraser debris” everywhere. Rub the tip to create friction (thus the name Frixion) which completely erases the ink without damaging your paper. 16. Mini Hole Puncher for Planners – hole punch 5.5″ x 8.5″ (half size US letter) paper to fit in your planner. 19. Staedtler Triplus Fineliner Pens – these have long been favorites of mine. Smooth writing, colorful permanent inks with a tip so fine they write like a ball point pen. 20. Washi Tape – make most anything prettier with washi tape. Great for labeling, this easy to remove tape adheres well to most surfaces. 21. Chalkboard Labels – another of my favorites! 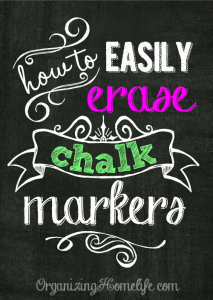 Use chalk markers on these vinyl labels to label and re-label easily. Simply clean with a damp cloth or Magic Eraser. 22. Bike Lift Hoist – keep bikes off the garage floor yet within reach with this bike lift. 24. Charging Station – neatly contain all those device cords inside this charging station. One cord to plug into the wall outlet creates a much neater situation. 25. Travel Packing Cubes – easily find daily outfits without creating a mess in your suitcase. 26. Battery Organizer – perfect for organizing most household sized batteries. Even contains a drawer for disc battery storage. Stores 82+ batteries and includes a tester. 27. 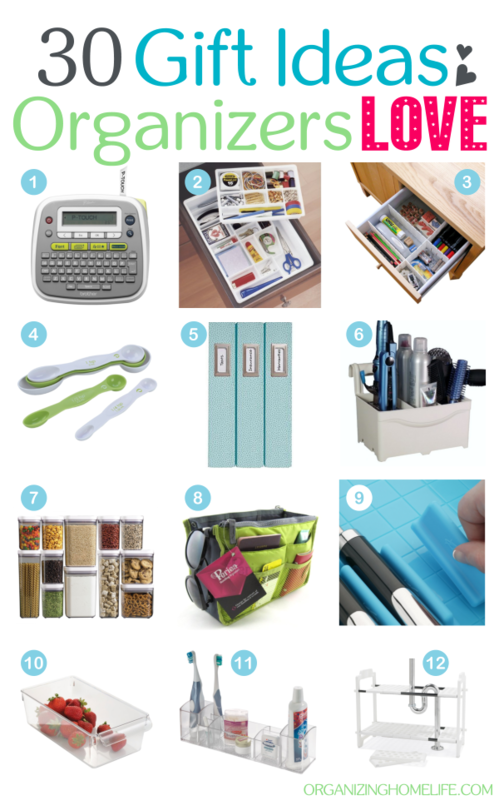 Grid-It Organizer – this is great for organizing gadgets and cords. 28. Portable Charger for Mobile Devices – never be caught without your digital calendar or schedule due to a low battery. I keep this in my purse and always have the ability to charge my phone or tablet close at hand. 29. Crop Hopper Photo Case – neatly store over 2000 photos in divided sections. My favorite part of this case is that it opens on the rear side and has a large open space to store larger photos (8″ x 10″, 5″ x 7″ sizes, and more). Fantastic list. My husband just asked me to make a list of things I want for Christmas. I have trouble thinking of things for myself, so I told him I would think about it. Then I signed on to Pinterest, and the link to this page was the first suggestion for me. Great timing. I just showed him your page. Thanks. 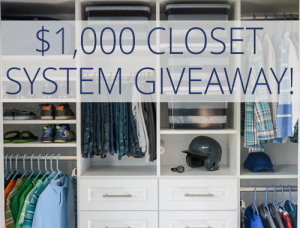 We love all things storage and your list looks very similar to ours this year! Good luck receiving them all! Great list. DrawerDecor is awesome! And I use my laminator constantly! I’ve been wanting a scanner. What’s your opinion on a reasonably priced one for home use? Thanks!